Headphones/Earbuds must be worn for Binaural Tones to be Effective. This app uses advanced Binaural Brainwave Entrainment to stimulate brainwave frequencies associated with different states of mind. Brainwave frequencies are in most cases below the range of human hearing and therefore must be induced through the use of binaural tones, a technique where two different audible frequencies are played into each ear to induce an inaudible low frequency beat. Headphones or earbuds must be worn for this technique to be effective, as the left and right audio must each be isolated. During the entrainment process the two different carrier tones are played, one intended for one ear, and the other tone intended for the other ear. The frequency difference between these tones depends on the target state of mind. The user will hear these carrier tones as an audible tone, however, when processing these two different tones the human brain will perceive the small frequency difference between the tones as an inaudible periodic beat. While exposed to this beat the user's brainwaves will begin to "fall into step", or synchronize with the beat, which has been designed to match a specific state of mind. As an example, the human ear can't directly perceive the .5 - 2 Hz Delta-wave frequencies associated with deep sleep because it is well below human hearing range, but if you wear headphones or earbuds with one side playing a 135 Hz tone and the other playing a 136 Hz tone your brain will perceive the 1 Hz difference between those frequencies as a periodic beat matching a low delta wave frequency. As you listen your own brainwaves will begin to match that frequency, which in this example induces an ideal state for sleep. The process is the same for other states of mind and their associated brainwave frequencies. To help make the process more relaxing and enjoyable ambient background sounds have been included in the app. The balance between the volume of the binaural brainwave tones and the volume of the ambient background is also adjustable, allowing you to create the most relaxing and effective brainwave entrainment experience possible. We have also included the ability for users to create a playlist of their own iTunes library music as users often have their own Nature Tracks or Classicial Music, which like the included Ambience, can help the entrainment process by creating a relaxing background. Important note regarding using iTunes Audio Volume: When using iTunes Music the Ambient Background volume slider dissappears because iTunes audio volume cannot be controlled independently of the device volume (controlled with the physical volume control on the side of the device). Only App-generated or bundled audio can have its volume freely adjusted. Whether using the included Ambience or your own iTunes tracks The Brainwave Tones only need to be audible to be effective; they don't have to be dominant sound to be effective. Banzai Labs' Brainwave Entrainment apps have been designed from the ground up to be the most advanced and effective binaural brainwave entrainment applications available. Every aspect of the audio design has been tuned to maximimize the effectiveness of the brainwave entrainment programs. For example, the audible components of binaural tones have been designed to be close in frequency to the well known "Om" chant frequency, which is the sound made by buddhist monks during meditation. This is known to be deeply relaxing and to enhance the mind's receptiveness to the entrainment process. This application also improves upon standard binaural techniques by overlaying multiple binaural tones to stimulate a range of brainwave frequencies simultaneously. In addition to these layers we also use multi-stage progressions to gently bring the user to the desired frequency in stages to create very specific states of mind. These techniques allow our applications to take the user through a series of stages that combine to create completely unique experiences. Each program is composed of between 1 and 7 stages. Some programs do not require multiple stages in order to achieve the target mental state, while others require several stages. On the iPhone or iPod Touch tapping on the Program Details button will display a description of the selected program, as well as the number of stages the selected program contains. If only a single program is present in the app, then tapping this button will display the description for that program. This button is not present when the app is run on the iPad as the program details are always visible on that device. As you change programs on the program selection dial you will notice a white bar above and below the duration selection buttons indicating the recommended minimum duration for the selected program. You will also see this duration shown in the program details described above. To play the program for the recommended duration tap the duration button highlighted by the two white bars. This will set the timer to that duration. If you select a duration longer than recommended the app will automatically adjust each stage accordingly. If you select a shorter time the program may not be as effective. If the app contains multiple programs you may find that the first stage of some programs can sound similar, this is because some programs require similar initial stages. For example, two programs may both begin with a relaxing Alpha/Theta wave stage first, before diverging and progressing into unique stages. In some cases this is to relax the mind initially and create a more receptive environment for the later brainwave entrainment stages. If the brainwave program you're using is composed of multiple stages you will hear each stage fade-out before the next stage fades-in. This is to make the transition as smooth and comfortable as possible. To adjust the duration of the audio volume fade between stages, as well as the fade duration for the beginning and end of the program, tap the button. This will launch the brainwave settings dialog where you can modify the fade duration between stages to between 0 seconds to 5 seconds. If you prefer to have no fade-out or fade-in between stages simply set the "Stage Fade Duration" to 0 seconds. Note: The actual fade duration used in the app may be stretched out longer than the fade duration you've set as it will be automatically lengthened depending on the volume of the device and brainwaves to avoid distortion. In addition to using fade-in and fade-out effects, all program stages have been designed to use a closely matching carrier frequency, the "Om" frequency mentioned above, so as to avoid a startling audible difference between each stage of a given program. Other binaural applications use vastly different carrier waves for different types of binaural beats. When this is done though it is typically only for effect and can actually disturb the entrainment process. What matters is not the audible component of the carrier signal, but the inaudible difference between the frequencies being	played into each ear. Therefore, we intentially try to keep the carrier waves within certain relaxing ranges to make the experience more comfortable for the user. The instructions in this document detail how to use the app and explain the different settings and options that are available. It's important though to also understand what to expect when you press play and to know where to focus your mind to maximize the effectiveness of the brainwave entrainment process. First, depending on how you've configured your volume settings you will hear two sounds after you've selected a program and pressed play. One is the background ambient audio and the other sound is the audible component of the brainwave signal, the binaural tones. The ambient sound is only there to help you relax and to perhaps help block out background sounds to minimize interruption. The brainwave audio only needs to be audible to be effective. It is not necessary to consciously focus on the sounds in order for your mind to process and perceive the binaural beat. If the program contains multiple stages you will hear a noticeable change in the brainwave carrier audio when one stage ends and the next begins. You can adjust the audio fade in the app settings to modify the transition between stages so the volume tapers off gradually when one program ends and then builds up again as the next program begins. How this is set is a matter of personal preference and comfort. The brainwave entrainment process takes several minutes to take hold and is best achieved by not consciously "trying" to achieve the given state. It is more important to relax than to try to consciously focus your mind on the brainwave audio. A different tone will be played into each ear and it is essential that each ear only hear one side. Check that the physical volume controls on the device are adjusted to your comfort level and that the mute switch is not enabled. Select a program based on your desired state of mind using the Program Selection Dial. Your app may have a single program built into it, in which case it's not necessary to select a program. 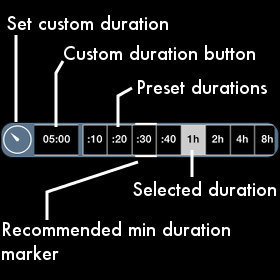 Select from a preset duration on the duration control bar, or Set and Use a Custom Duration (This sets the value of the first button on the duration bar to your custom time so you can return to it later). The Minimum Recommended Duration for the Current Program is indicated on the Duration Control by the White Lines above and below the minimum duration. Due to the variations in the number and type of brainwave stages used in each program some will require a longer period of time in order for each sequence to have sufficient entrainment time. You can also choose to select a time duration longer than the minimum recommended duration, in which case each stage of the program will be proportionally lengthened based on the focus of the program. You may also select a shorter than recommended duration, however the program may not be as effective. 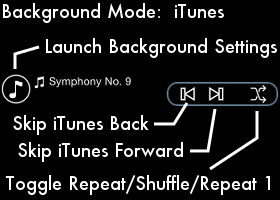 Tap to change the background audio or select your iTunes Music. In order to support mixing iTunes Audio with Brainwave Audio this app is not able to support remotes or the iOS slide-up playback menu, so you must play, pause, stop, or skip using this apps controls or the Native iOS iTunes App will begin playing. Skipping Foward or Back must be done within the Brainwave app. The brainwave entrainment process is equally effective with each of the background ambient sounds provided. When using our app you cannot use the iOS playback controls or earbud remotes. This is a limitation of iOS if an app wants to combine internal audio with iTunes then the remote controls are passed to the iTunes App on the device rather than our app. Your choice of volume balance won't alter the effectiveness of the entrainment process so long as the binaural carrier tones are audible. The binaural tones don't need to be the dominant sound to be effective. You can also choose to combine Brainwaves, Ambience, and iTunes audio, if you have a guided meditation or hypnosis track you would like to combine with our audio. 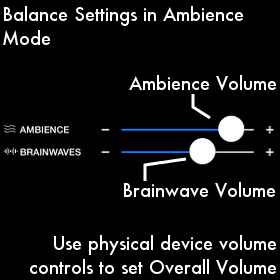 If you're using the included Ambience for the background audio you can adjust the volume balance between the brainwaves and the background audio to your comfort level using the Ambience and Balance balance controls. The overall volume of the combined audio is set using the device's physical volume controls. If you're using iTunes audio as the background it can only be played at the physical device volume, but you can still adjust the brainwave audio volume. The reason for this limitation is that iOS treats iTunes audio differently from audio played within an app. iOS always links iTunes volume to the Device volume, and does not allow it to be played lower than the device volume. 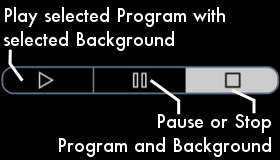 Play, Pause or Stop both the Selected Program and Selected Background together. When Play or Pause are pressed the Program Selection Dial will be disabled to avoid it being changed accidentally during the program. Pressing the Stop button reactivates the Program Selection Dial. Pause and Stop also stops the Alarm if it is playing. Audio will continue to fade momentarily when you tap Pause or Stop. You can set whether to fade the audio down when you press stop or pause in the Fade Settings, . Note that iTunes audio is not faded as that requires lowering the device volume as well. Warning: Never listen while driving or operating machinery. Tapping the button opens the Save Settings and Preferences Menu. When the button appears with an arrow that means saved settings already exist for the selected program that you can load. The Allows you to save your current settings for the currently selected program (the program in the selected position in the Program Selection Dial). Saved settings include preferred background audio, iTunes playlist, fade settings, duration, and alarm settings. Program Fade Time: This is the amount of time (between 0 and 5 seconds) to spend fading into the program and background audio at the beginning as well as how long to spend fading out at the end. When set to lowest setting (0 seconds) the program will begin immediately at your preferred volume setting. When set to its maximum (5 seconds) the volume will build up to your max volume setting over a period of 5 seconds. Stage Fade Time: This is the amount of time (between 0 and 5 seconds) to spend fading into the individual stages within a brainwave program. When set to lowest setting (0 seconds) each program program stage will begin immediately at your preferred volume setting. Subsequent program stages will also begin and end abruptly with no fade-in or fade-out. When set to its maximum (5 seconds) the volume will build up to your max volume setting over a period of 5 seconds. The Program and Stage Fade durations may be further lengthened to adjust for higher volumes. Below is a description of the ranges of brainwave frequencies used by the BrainWave Programs. In addition to the base frequencies we also use border frequencies, layered frequencies, and unique sequences of base frequencies designed specifically for each program. These techniques are what allow this application to create such finely tuned mental states and experiences. On the iPhone or iPod Touch, to view program descriptions as well as recommended minimum usage durations tap the button. On the iPad the description of the selected program is always visible. The choice of which ambient background to use does not affect the effectiveness of binaural brainwave entrainment. Choose the background that is most relaxing to help improve receptivity to the entrainment process. 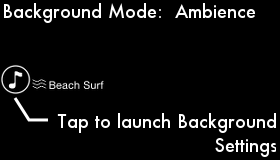 Tap the button to select one of the available ambient backgrounds. You can adjust the volume balance between the binaural tones and the background to suit your comfort level, as long as the brainwave audio is still audible. This app also allows you to create your own playlist of iTunes music and save that playlist as part of your saved preferences for each program. Be sure to download the audio from iCloud to the device for it to function properly within the app. If you have Hypnosis, Affirmation or other tracks in iTunes that you would like to combine with the audio in the app you can also choose to play both iTunes audio and an included ambient background as well. This app includes an alarm that can be played at the end of a program to either wake you up or signal the end of a meditation session. 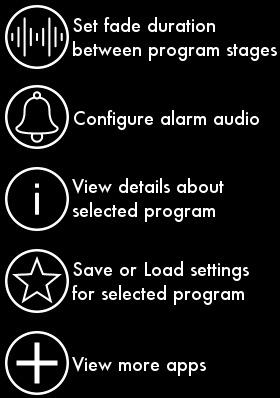 Tap the button to bring up the alarm menu where you can enable/disable the alarm, configure its volume, and select from different sound options. This app has built-in UIs for iPhone and iPad. It supports Portrait orientation on the iPhone and iPod Touch, and All orientations on the iPad. On the iPad the UI will switch between landscape and portrait views when the device is rotated. Each time the device is rotated the lock/release autorotation toggle button appears at the top of the screen for 15 seconds. When the orientation is locked to Portrait or Landscape, the button appears as to indicate that Tapping it then will allow rotation between Portrait and Landscape. When the orientation is allowed to rotate the button appears as to indicate that tapping it will toggle autorotation to locked. Question: Will the app work if I listen over my stereo speakers? Answer: No, you must wear headphones or earbuds in order for the app to work. Two different frequencies will be played into each ear and it is essential that each ear only hear one of the frequencies. Question: Why can't I use a remote or the iTunes "Now Playing" controls to skip audio track or play/pause the audio? Answer: In order to mix iTunes audio with brainwave audio iTunes must receive the remote control messages. So if you tap the play or pause button on your earbud remote it will interrupt our apt briefly and attempt to play audio from the native iTunes music player. As soon as the capability is available we will integrate remote control options as well. 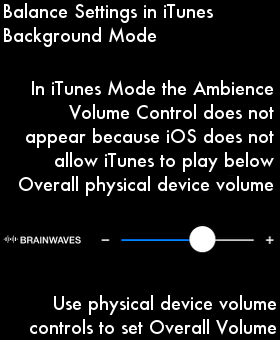 Answer: This is due to the same issue that prevents the "now playing" controls in iOS from controlling the audio in BrainWave. Because we need to have flexibility for users to be able to use iTunes audio, or other apps, as background the play and pause button presses are handled by the iOS Music Player instead of our app. Question: Does the volume of the background ambience affect the brainwave entrainment process? Answer: The brainwave entrainment signal only needs to be audible to be effective, so generally speaking the background ambience won't affect the effectiveness of the brainwave programs. Question: Do I need to concentrate on the brainwave sound for the app to work? Answer: No, just relax as that will do more to make your mind more receptive to the entrainment process. Question: Why does the volume of the brainwave portion of the audio fade in and out? Answer: Each program in this app is composed of a series of different brainwave entrainment stages, each with unique binaural tones and carrier frequencies. So as to not disturb the user the volume fades out during the stage transition, and then fades-in when the next stage begins. Question: I just updated the app and now when I lock the screen the sound turns off. How do I keep it playing? Answer: Occasionally this can happen following an update. Restarting the device resolves the issue so the app can continue playing after the device is locked. Question: Only the ambient background part of the audio is playing, why can't I hear the brainwave tones? Answer: Be sure that you're wearing headphones or earbuds as they're required for the binaural beats to be perceived, and double check that you have the brainwave volume slider turned up. If you still can't hear the brainwave audio restart the device as the app may not have been allocated sufficient memory to function properly. When you restart be sure to fully shutdown the device by holding down the power button on the top of the device until the "Slide to Power Off" indicator appears and then slide that control. Question: If I'm using a sleep program when should I begin using the app? Answer: For sleep programs you should start the program when you lie down to sleep. Question: Am I supposed to use programs for Concentration or Brainstorming before or during an activity? Answer: There are benefits to using the programs both before and during, just as long as the activity isn't driving, walking/crossing streets, operating machinery etc. Cognitively elevating programs such as those for Focus, Memory, Brainstorming are meant to be used in preparation for, or during, activities such as studying, working at the computer or reading. Question: Will a Relaxation program still work if I'm listening while working at the computer? Answer: Yes, however, it will be more effective if you're lying down or sitting quietly. To some degree your work will maintain higher frequency brainwaves, but the binaural tones will still have an entrainment effect. So there is still a benefit if you're under stress and working at the computer and need to relax. Please contact support@banzailabs.com if you have any questions, comments or suggestions. You can do this by tapping "Email Support" in the app. Warning: Do not use while driving or operating machinery or walking near traffic. Note: Headphones or earbuds are required for binaural tones to be effective. We make our new releases Free on their launch day and announce those giveaways on Facebook and Twitter, so be sure to follow us to receive those announcements and download our new releases for Free! Thank you for purchasing our app. We strive to create apps that are inspiring and enjoyable to use, so if you have suggestions or questions please tap "Email Support" button and we'll be happy to get back to you. Over 500 Spectacular Space Wallpaper images! Math Fleet - Practice Addition, Subtraction, Multiplication and Division as you Pilot a Starship and Defend Earth with Math! Kids Learn to Solve Math Problems quickly, under Pressure while having Fun! If you'd like to hear about other Free App announcements you can also follow Banzai Labs on Facebook and Twitter. We're continually developing cutting edge apps in new areas such as Educational Gaming and Travel and we make those new apps free on their launch day! Copyright © 2012 Banzai Labs Inc. All Rights Reserved.